As the heart of the home, the kitchen is one place where an update is necessary from time to time to keep it looking fresh. Are you dreaming of a Butcher Block Countertop? 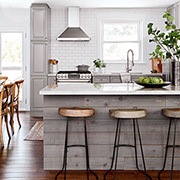 There is something about butcher block countertops that add rustic charm to a kitchen and just the right amount of warmth to an otherwise sterile design. There are hundreds of videos online by DIY enthusiasts making their own wood countertops, but not all provide you with accurate information for the best way to make your own wood countertops. 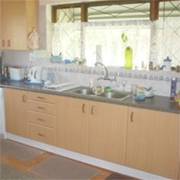 Our very own DIY Diva, Nancy Muchangwa, offers a variety of services for small to medium kitchen improvements and renovations. If you want to give your kitchen a modern update, installing soft-close hinges and drawer sliders is an inexpensive solution. 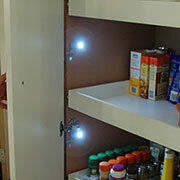 Gelmar EcoLED Cupboard Lights are perfect for lighting up a pantry or cupboard. Rust-Oleum's Tub & Tile kit is an affordable alternative to the mess of replacing tiles, and it transforms this kitchen backsplash in a day. 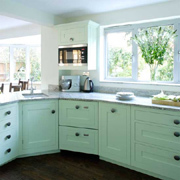 What Defines a Shaker Style Kitchen? Shaker kitchens have become a popular choice for many homeowners wanting a DIY kitchen option, but what defines a Shaker kitchen? 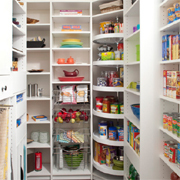 This pullout pantry gives you a huge amount of storage space in a kitchen, and you can easily fit it into an empty corner, or replace an existing floor unit. 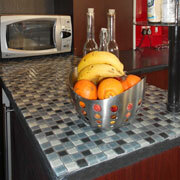 If you can't afford to rip out and replace ugly tiles, you can easily disguise them with Tile Stickers! 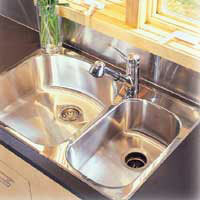 Give your kitchen a much needed update with new stainless steel sink and taps on special at Gelmar. Hard to believe that the kitchen featured here has secondhand cabinets that cost thousands less than a new kitchen installation. 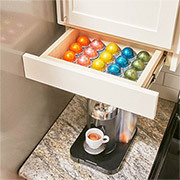 The space at the top of kitchen cabinets generally goes to waste if you don't have cabinet to the ceiling, but you can make use of this valuable space. When you've got a kitchen that's on the small size, it's always a good idea to look at smart storage solutions for keeping all your stuff organised. 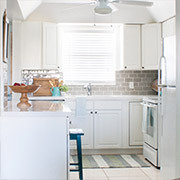 At the time of buying their house, these homeowners made the decision to put in a cheap, contractor-grade kitchen as a temporary measure with the intention to upgrade as the family increased. If you're running out of storage in your kitchen, here's a way to install handy storage drawers underneath your wall mounted cupboards. 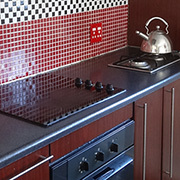 If you're planning a DIY kitchen renovation, you don't want to compromise on quality but still want affordable options. 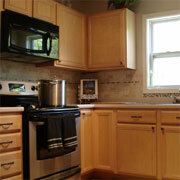 In this article we show you how to make your own kitchen cabinets to install a DIY kitchen from scratch. 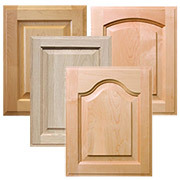 When you take the DIY option to renovate or improve a kitche, chances are you will want to add new kitchen cabinet doors. 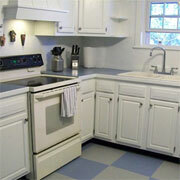 This kitchen makeover shows you exactly what white can do for a small, pokey kitchen. 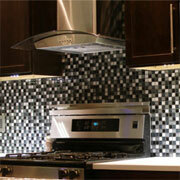 Here's a great idea to try if you're looking for a new kitchen backsplash. 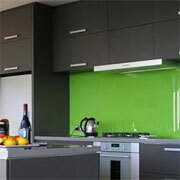 Stencils offer an easy way to design your own faux splashback. 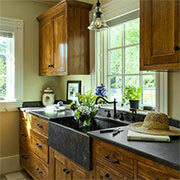 Updating your kitchen cabinet hardware is an easy way to give any kitchen an instant makeover. 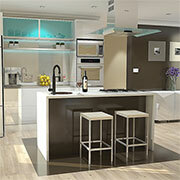 The modern kitchen is moving away from all-white and neutral colours and embracing the two-tone look. 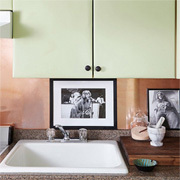 If your kitchen cabinets are an eyesore but you don't have the budget to replace, consider how paint can be used to transform kitchen cabinets. 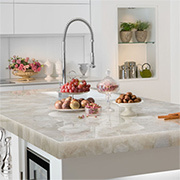 WOMAG introduces five brand new colourways in its Phoenix Stone collection of superior quartz surfaces. 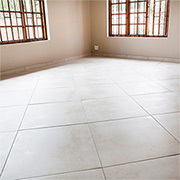 Being able to lay new tiles over existing tiles not only saves you money, but also a lot of mess and hassle. 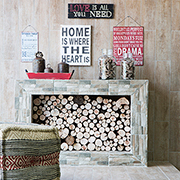 Not all tiles can be tiled over and we look at how to successfully tile over tile. 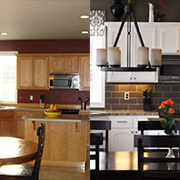 If you are looking to renovate or makeover a kitchen, we put together a selection of before and after kitchen renovation ideas to inspire you. 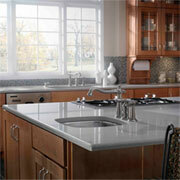 It might not be everyone's choice, but Formica Countertops are still the most affordable option for many homeowners. 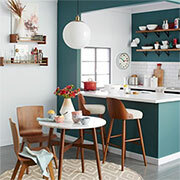 If you are desperate to give your kitchen a new look but don't have the budget, here's a mini-makeover that won't cost that much AND is quick and easy. Eureka, South Africa's hardware expert, have launched a range of concealed hinges, specifically for those looking for an affordable alternative for cabinet hardware. 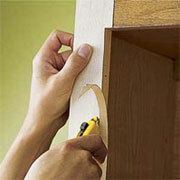 Now you can add soft-closing concealed hinges to your cabinets and cupboards. Why tile when you can inject colour, texture and personality into a home with skim-on, cement-based decorative plasters amd wall finishes. Over the course of the few months, I will be ripping out my old kitchen and installing a DIY kitchen from scratch. 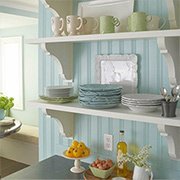 Given the total lack of choice when it comes to decorative shelf brackets, making your own DIY shelf brackets is the way to go! 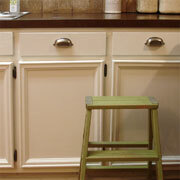 If you need to refinish cracked or peeling kitchen cabinet doors to paint them, you can do this yourself to save money. 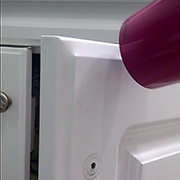 We show you how to remove foil wrap from kitchen cabinet doors. 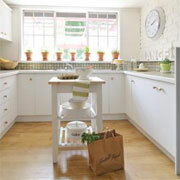 When planning a new kitchen, or renovating an existing kitchen, it’s important to establish a budget. 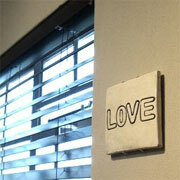 A budget will stop you from viewing - and falling in love with - options that are not in your price range. 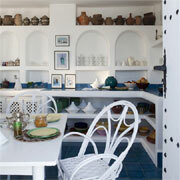 If you are thinking about painting your kitchen cupboards, take a look at a painted kitchen... and 5 years on. When you have a small kitchen, especially one that is open onto a dining room or dining nook, it's important to make sure it is well planned and neatly organised. 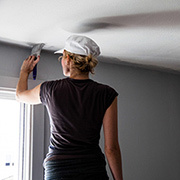 Using paint to renovate a kitchen allows you more money to spend on buying new appliances to modernise and update the room without spending too much. Whether you opt for luxury vinyl flooring or inexpensive vinyl tiles, vinyl offers a durable flooring option for a kitchen that is easy to maintain, long lasting and an easy DIY option. 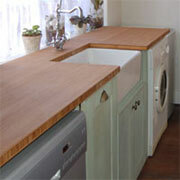 I am seriously thinking about ripping out my melamine kitchen and fitting a country or farmhouse kitchen. 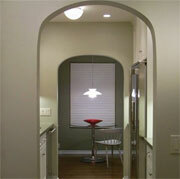 This is a style that lends itself to comfortable living with tons of personality, and one that's also easy to DIY. When renovating a old home, this couple opted to move their kitchen from the back of the house to the front. The kitchen is the heart of a home so it's understandable that you want yours to be at masterchef level (or as close to it as possible). 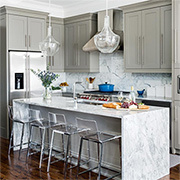 Imagine the heart of your home with some of these biggest kitchen trends. 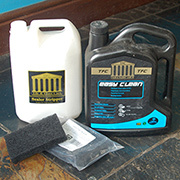 Tile and Floor Care (TFC) have an extensive range of products for natural stone and tiled floors. In this feature we strip and seal a slate tile floor. 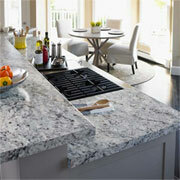 Homeowners are choosing engineered materials over natural stone for countertops. 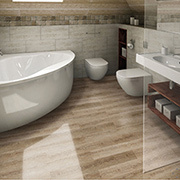 Luxury vinyl tiles are definitely an option to consider when looking for flooring alternatives. 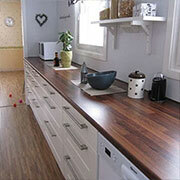 Vinyl planks simulate the look of real wood without the noise, durability or cleaning concerns. 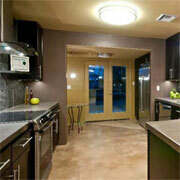 Now, you can install vinyl floors over ceramic tiles. 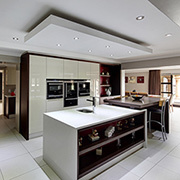 A new kitchen can be a very expensive project, but taking the DIY route can save you thousands of Rands and still provide a modern fitted kitchen. 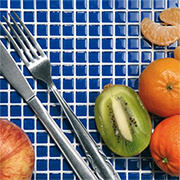 Starlike is the first epoxy grout to offer antibacterial properties for bathrooms and kitchens. Plus, all the colours of Starlike range are UV-resistant, making them suitable both for indoor and outdoor use. 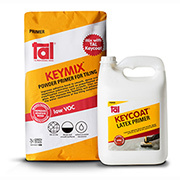 Homeowners tackling their own tiling projects can overcome the potential lifting of tiles linked to surfaces that are dense, impervious or smooth, by using the new TAL Keymix powder primer. If you are looking for an affordable solution for solid wood countertops, or want to replace Formica countertops with wood, here's how to use PAR pine planks to make your own kitchen countertops. 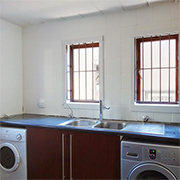 Many townhouses and apartments have compact kitchens that are small and claustrophobic. 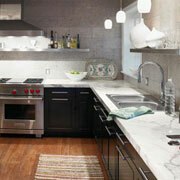 But there are designer tricks that you can apply to make even the smallest kitchen feel larger than it is. 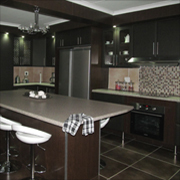 Quite a few years back I renovated my kitchen as a DIY project and managed to save myself close to R75,000 in the process. Almost 10 years later the kitchen still looks good. 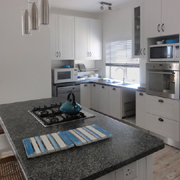 I often receive enquiries for homeowners wanting to paint their kitchen cabinets and the best products and methods for painting kitchen cabinets. Here are some tips to guide you. 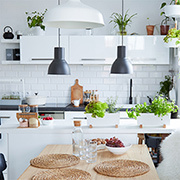 If you are working on a limited budget but want to give your kitchen a makeover, give these ideas a try to breathe new life into a kitchen. 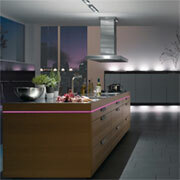 The kitchen is considered the heart of the home. 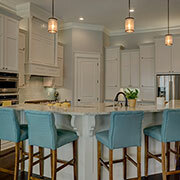 It's where families and guests gather to prepare and enjoy meals together while catching up on the day’s activities. Ceilings tend to receive the least amount of attention when it comes to decorating, but here are a few tips to let your ceilings be a feature rather than an eyesore! 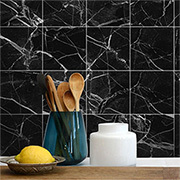 The evolution of design has increased the versatility of tiles. 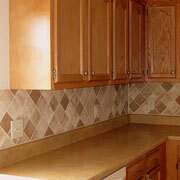 Though mainly used for kitchen and bathrooms, tiles are perfect for every room in a home. 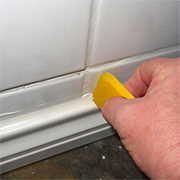 Too many homeowners put off bathroom projects because it involves drilling through tiles, but if you have the right tools and accessories drilling through tiles is a quick and easy project. 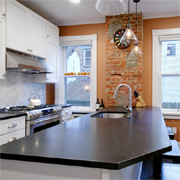 Not every homeowner can afford the luxury of stone countertops, and Formica countertops offer you an affordable way to update a kitchen. Burger and his wife bought a fixer-upper duplex that needed some TLC and more than a bit of renovation. 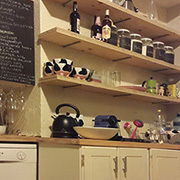 One area in desperate need of DIY was the kitchen and they opted for a farm style layout that would allow them to do most of the work themselves. Having recently tiled the backsplash in my kitchen I figured it was finally time to put up the extractor fan to start finishing the project. 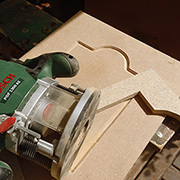 Being able to use a router to make decorative kitchen cabinet doors allows you to replace old cabinet doors with do-it-yourself doors in any size or design. 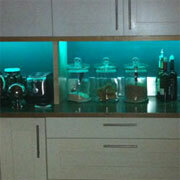 Some years back I added a perspex splashback - bad idea since perspex can't take the heat ! 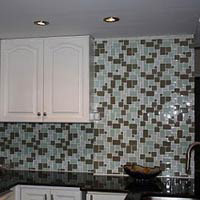 In this project I remove the perspex backsplash and replace with glass mosaic tiles. 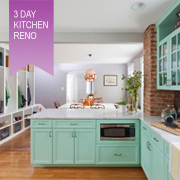 If you are planning on spending your annual holidays on renovating the kitchen you will find inspiration in these kitchen renovations that didn't cost a fortune but did give dated kitchens a modern update and a brand new look. 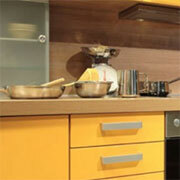 The trend for painted kitchens continues as products and tools are introduced to make the process far easier. Tanya Joel is one of those people with a natural knack for turning average into amazing. The kitchen in her Linden flat is testament to her talent for decorative with an almost non-existent budget. A family of six make the decision to improve rather than move and this involved knocking down walls to enlarge a small kitchen into an open plan space that includes a family room. Formica LifeSeal or Mastertops kitchen countertops are one of the most affordable ways to update and replace scratched, swollen or worn countertops. 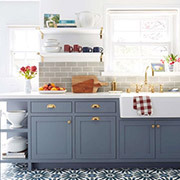 If you are looking for do-it-yourself options for a kitchen renovation or revamp, or even for a new kitchen installation, a Shaker style kitchen offers an affordable and easy way to build a new kitchen from scratch with basic power tools and a bit of DIY savvy. In a newly built home the homeowners will design a kitchen that meets their immediate needs, but in an older home it's nice to know that improvements can be done to keep up with modern trends. To complete the tiling project recently done in the kitchen, and to finish off the project, skirtings were added around the base of the walls. Previously there weren't any skirtings whatsoever and it just looked unfinished. I will soon be featuring a project where I removed the carpets in my bedroom and dressing room and replaced them with tiles imprinted with a wood grain finish. 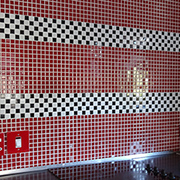 I have been waiting to tile my kitchen finished for a few years. After the kitchen revamp I didn't know what to do with the tiles around the windows, since the burglar bars were welding in and couldn't be removed. 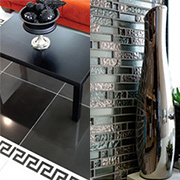 Take a visit to the tile section at your local Builders Warehouse and you will see a selection of glass mosaic tile sheets in colours and textures. My kitchen is currently as per the pic above, which I feel is outdated. I think the cupboards are supawood / melawood. Can one paint over this? Could you suggest any ideas for colour to revamp the kitchen. 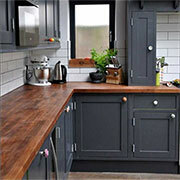 If you find your kitchen depressing and more than a little sad and try to spend as little time in there as possible, perhaps it's time to look at what options are available to turn a dark and dingy kitchen into a kitchen that you love to spend time in. I have a plain white melamine kitchen. My kitchen is quite large with many cupboards and deep drawers. 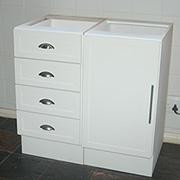 The doors and drawer fronts are plain without any design, and which has become boring since day two. 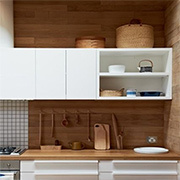 If you don't have the budget to enlarge a small kitchen there are plenty of tips and tricks that you can use to make a small kitchen feel less confined, provide extra storage and boost even boost up the light levels. 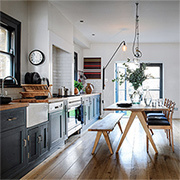 As the trend for open-plan living increases, closing off a kitchen only devalues a property unless it lends to the design, especially when there are ways and means to detract, but not completely close off, a kitchen. 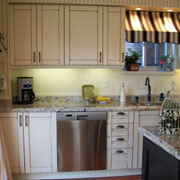 Hard to believe that this kitchen renovation only took three days from start to finish. 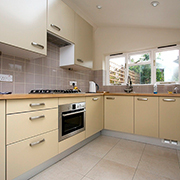 With clever planning and a clear idea of what you want to do, any kitchen renovation can be done painlessly and without too much disruption. Previously a dark and dingy space, adding on an extension to house a new kitchen has transformed this space in one filled with light and space. Tiling a floor, any floor, is not that difficult if you have the right tools at hand and a bit of DIY savvy when it comes to laying tile. 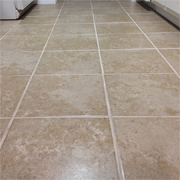 In this article we show you how to remove vinyl tile from a kitchen floor - two layers of vinyl tile in fact - and lay a ceramic tile floor. 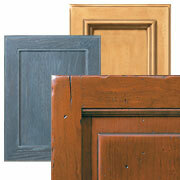 Every kitchen renovation boils down to the same thing... decision, decisions, decisions. 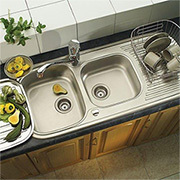 Everything from A to Z needs to be considered and options looked at - including the kitchen sink. The new dark wood kitchen features plenty of storage space and there was plenty of room to add an island that provides additional countertop working space and comfortably seats six. 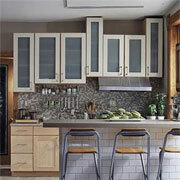 Give kitchen cabinets a makeover? 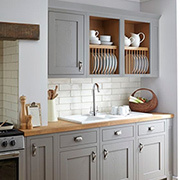 Pop into your local Builders Warehouse and stock up on moulding and trim to give you kitchen cabinets a quick and easy makeover. You might only have a large cupboard or hoekie as a pantry, but if there is one essential component that every pantry should have it's a lazy susan or turntable storage system. 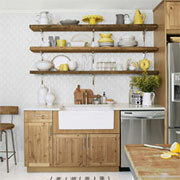 This do-it-yourself kitchen shows how you can transform any space with just a few basic tools. 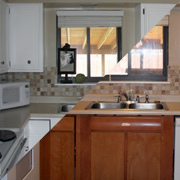 Loraine and her husband Cobi transformed a boring space into a beautiful kitchen. 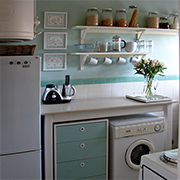 While most kitchens are designed to allow for 1 or 2 appliances such as a washing machine or dishwasher, there are kitchens that could do with the extra cupboard space for storage and a washing machine, tumble dryer can be relocated to another area. Plywood is one of the most affordable materials that you can use for DIY projects, and especially for building your own kitchen cabinets. Plywood is considered a sustainable building material that is durable. 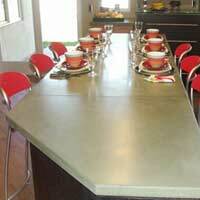 When most people think of DIY concrete countertops, the first reaction is that making a concrete countertop is not easy. Well, there is a fair amount of work involved, but at the end of the day you could save yourself thousands. 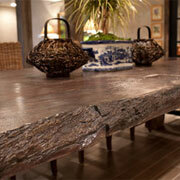 Now you can have concrete countertops that resemble real wood. While not yet available locally, there is bound to be someone out there who is looking at the possibility of crafting concrete countertops that look like wood. 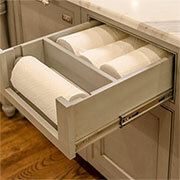 As the hardest working room in any home, the kitchen needs plenty of storage space. 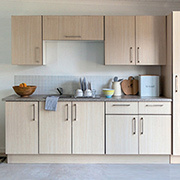 While cabinets and cupboards may already be fitted, as a family grows - so does its storage requirements. I gave my kitchen countertop a makeover. After a couple of weeks of living with it, I decided I wasn't happy and wanted to consider another option - applying mosaic tile to a kitchen countertop. 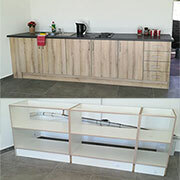 This project shows you how easy it is to completely transform a kitchen - on a limited budget and in a couple of weekends. Buying a older home can be a challenge. 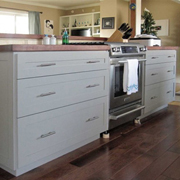 Cheap plywood cabinets, walled-off pantry and laundry, non-functioning appliances and coloured tiles are just a few of the projects you are looking at. If you’re looking for a countertop that will make a dramatic style statement, consider products made of glass, concrete, bamboo, or scrap metal. With so much emphasis being placed on recycle, reuse and restore, giving your fridge or freezer a makeover is just one of the ways to extend its life so that it doesn't end up on the rubbish dump. As an area of the home that is used on a daily basis by all members of a family, the kitchen needs to be highly organised. 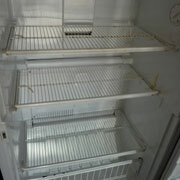 Regardless of whether you like to cook or not, it pays to have this particular space sorted and clutter free. As the hardest working surface in any kitchen, kitchen countertops not only need to look stylish, they need to be hardworking too! 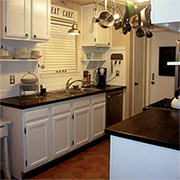 Lisa of Recaptured Charm shows how easy it is to transform a kitchen without spending a fortune. 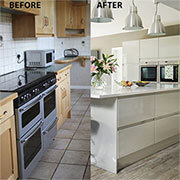 In this feature we show how she gave her kitchen doors a makeover for a kitchen that went from shabby to chic! 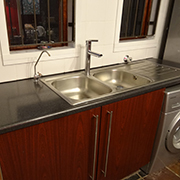 Bet you didn't know that a new Formica Lifeseal countertop will only cost you around R850 for a 3,6 metre length. 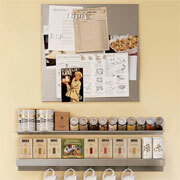 Not bad when you think that this is long enough for most small kitchens. 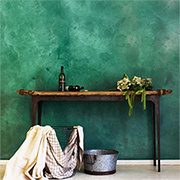 Using paint allows you to match your existing style and colour and it won't cost you a fortune. More and more homeowners are realising the benefits of having a cement screed floor. Not only is this type of flooring inexpensive, it's also extremely easy to maintain and considered a green alternative to other flooring options. 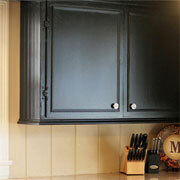 Give kitchen cupboards a new look by adding mitred moldings and trim to the existing cabinet doors. 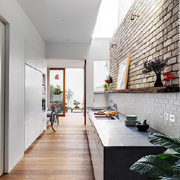 To increase the available size of a cramped kitchen, consider incorporating space from other rooms and underused exterior spaces to create a larger kitchen. What is a kitchen layout plan? 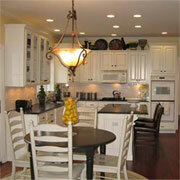 A kitchen layout or plan is something that not all people have complete control over. Unless you plan on remodelling your entire kitchen, knocking down walls, or extending your home, you must work within the confines of a given space. 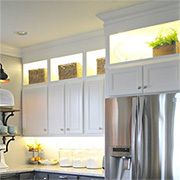 A kitchen needs a good well thought out lighting plan. 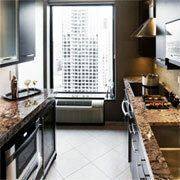 Today’s kitchens have many more functions than just cooking a meal. For many families it is the most frequently used room in the house. 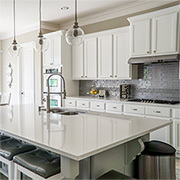 In today's economy where more homeowners are staying put and investing in their existing property, replacing existing kitchen cabinet doors is a far more affordable option than replacing an entire kitchen. 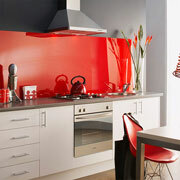 only does a glass splashback add colour and ambiance to the kitchen, it's a modern and affordable alternative to tiles and laminate. Simply by organising your laundry you can make laundry day less of a chore. 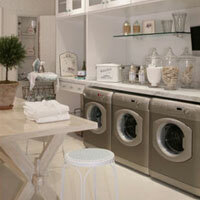 Here are a few ideas and inspirations to make your laundry room better organised. 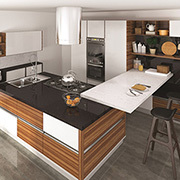 With some serious planning, ingenious fittings and a design that’s as chic as you like, your new kitchen can be super successful and, as you won’t need many units, you can splash out on quality finishes. 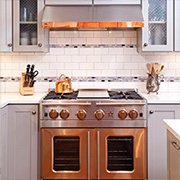 From the cabinets to the appliances, find out how to ensure a successful renovation. 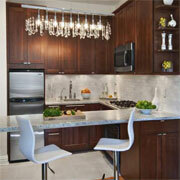 Renovating your kitchen will add ease to your lifestyle and value to your home. Still stuck in a tiny kitchen with no room to move? 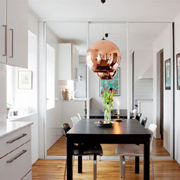 This article shows what a difference some small changes can do to improve your kitchen space and open up a small apartment. 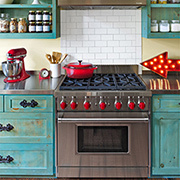 Some kitchen makeovers are pretty darn amazing. This is one of those. 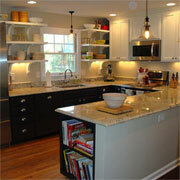 A kitchen is transformed with cabinets changed from bland white into an elegant black. 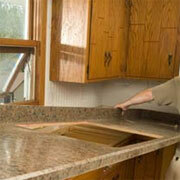 I would like to share a few things we would do differently if we were to start over on our concrete countertops. 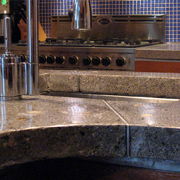 Don't get me wrong, we love our concrete countertops but we have also done some experimenting and would make a few slight changes. DIY concrete experts show how to design, build and install a beautiful concrete countertop for a newly remodelled kitchen. 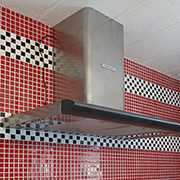 I receive quite a few enquiries from homeowners looking for alternatives to a plain, boring kitchen tile backsplash, and there are more than a few options to consider for removing, replacing or adding a new backsplash to a kitchen. 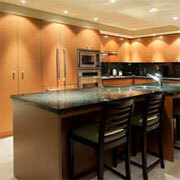 If you are planning to remodel your kitchen, then various aspects need to be considered before you begin. So, we recently decided to redo our kitchen, but with a twist. Instead of just getting someone in to do all at one, we were going to try and do as much as possible ourselves. 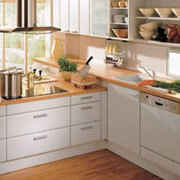 Planning to put your kitchen but don’t have the funds for a major improvement. 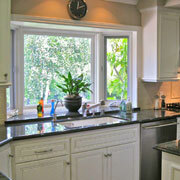 With the amount of time you spend in your kitchen, why settle for out-of-date features and décor? 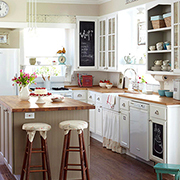 With the new Shaker and French Country kitchen range from Shabby-Chic you can build the kitchen of your dreams on an affordable budget. 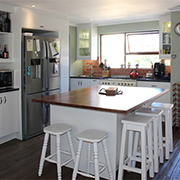 Total cost for this kitchen = R30,000 - including bamboo countertops! 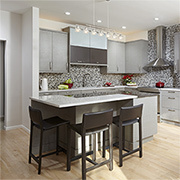 Having a modern kitchen is crucial in resale value. 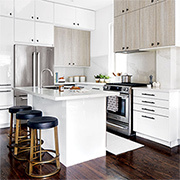 With the addition of new floors, cleaned up or new cabinets, up-to-date appliances and a modern backsplash these are all key components to a valuable kitchen. 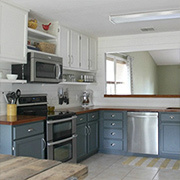 Not everyone likes a solid wood kitchen, and where you inherit and oak kitchen and want to paint the cabinets - you can! 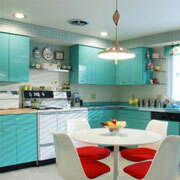 Looking for a fun way to add colour to a kitchen? The surface mounted LEDs allow these strips an amazing amount of flexibility without causing damage; they can bend and twist in just about any direction imaginable. 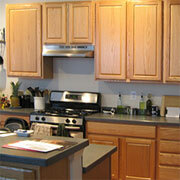 Two of the easiest and most affordable ways to give your kitchen a makeover is to paint or re-face kitchen cabinets. Painting kitchen cabinets allows you to create a custom kitchen, while re-facing can create a faux-wood finish without the price tag! 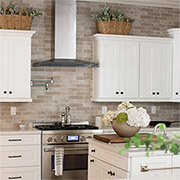 Whether you want to give your kitchen a new look, tone down the wood look in a kitchen, or spruce up your kitchen cabinets, there are two very easy techniques to consider for giving a kitchen a face lift. 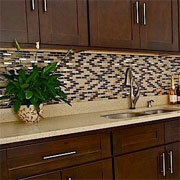 Using mosaic tile for a kitchen backsplash is an easy project. The hardest part is removing existing tiles, but with a bit of savvy you can easily overcome some of the hard work involved once the tiles have been removed. 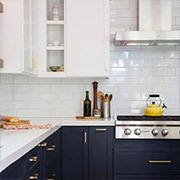 When your kitchen needs an update and you don't have a lot to spend, there are many ways to affordably give a kitchen a new look - even on the tightest budget. 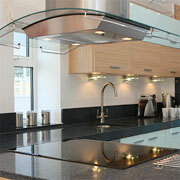 Remodelling a kitchen can be costly. 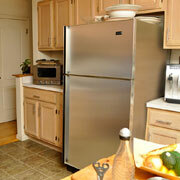 Yet even in today’s economic environment, it is one of the most efficient ways to add value to your entire home. Steel cabinets - no way! Painted aqua - you must be joking! 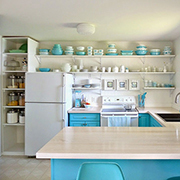 I have decided that this is my next kitchen - I just love the colours and the way it feel so fresh and vibrant. 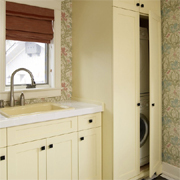 Simply by adding a coat or two of paint and adding a few new upper cabinets, this kitchen was transformed from cutie cottage to timeless and traditional. 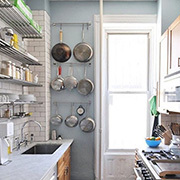 Here are just a few of the ways that readers have transformed their kitchen - without spending a lot of money and mostly on a do-it-yourself basis. There comes a time when just about anyone who had their home built off plan starts to hear a little nagging voice in the head. "Should I paint those kitchen cabinets?" The layout and design of your kitchen impacts on functionality and how well you are able to move around within the space. Adding raised panel doors allows you to be more creative with the style of door that you choose to replace existing kitchen doors. Installing a new sink and tap is easier than ever thanks to the simple-to-cut-and-assemble white plastic (PVC) drain parts and flexible water supply tubes. 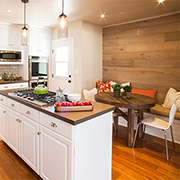 Kitchen Remodel Costs: What Should You Do to Save Money? 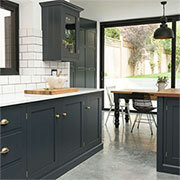 We’ve written this article to help you be in control of your money when redecorating your kitchen. 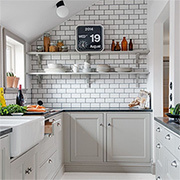 Whether you want to completely transform your kitchen or you need just a few tweaks to make it more suitable for your family, this project will require a lot of thinking through. 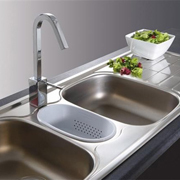 Tips to choosing the perfect faucet water filter for your kitchen sink. 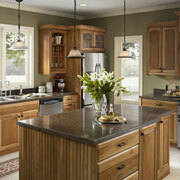 Remodeling a kitchen is an important decision. The costs are quite high given the amount of materials, specialists and time spent doing these transformations. All information, images, or otherwise, are the property of Janice Anderssen, or relevant copyright holders and for the latter Home-Dzine Network claims no intellectual, or any other property rights. Articles also provided by various sources. See our terms and conditions for use of this website.